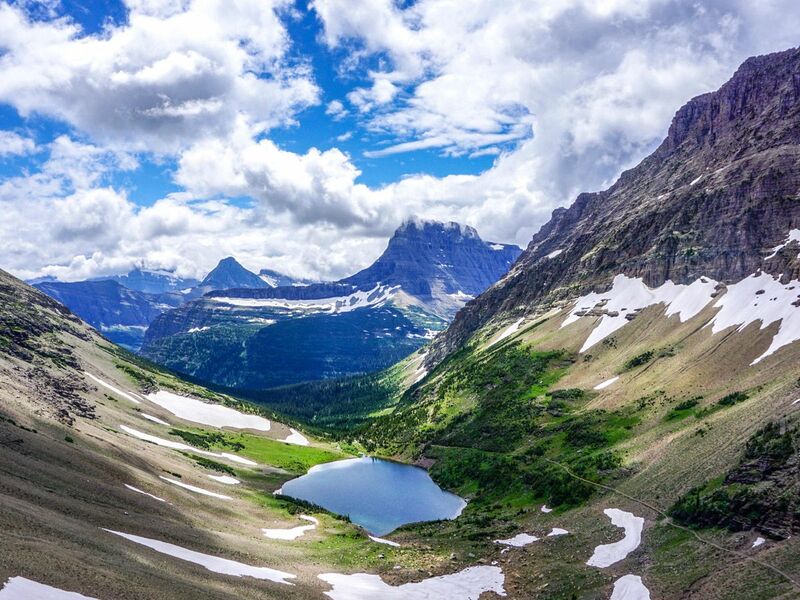 A hike to Ptarmigan Tunnel is a wonderful day out in the Many Glacier area of Glacier Park – complete with forest, streams, lakes and sheer cliffs. The trail through the Tunnel takes you into another world, with totally different, still stunning, views. 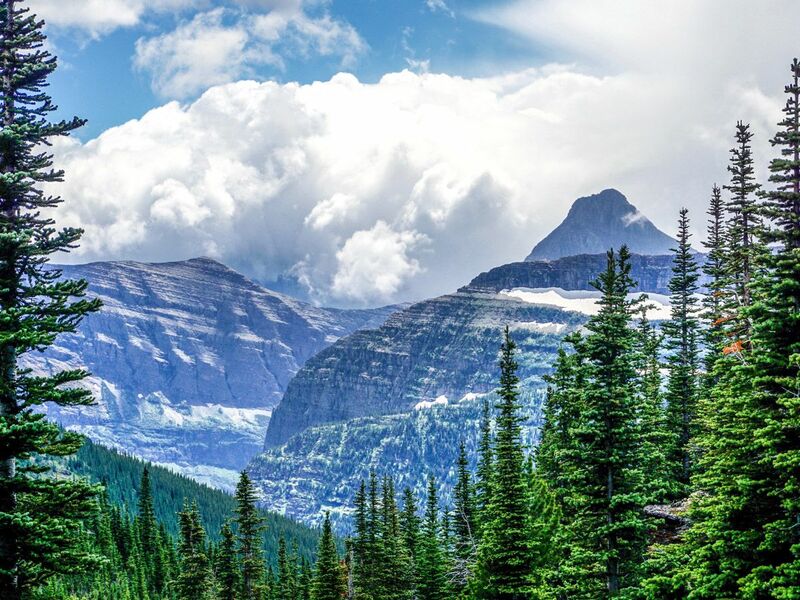 Head into Many Glacier Area on the pock-marked road, remaining watchful for animals – bears are likely in early summer here. Park anywhere near the Swiftcurrent Motor Inn. Parking here can fill up fast, so arrive early or be prepared to walk some ways down the road from where you parked! Halfway down the parking lot beside the Motor Inn there are signs pointing towards Ptarmigan Tunnel and Iceberg Lake. These signs direct you up a road, past several small cabins to a tiny parking lot for guests staying at the Swiftcurrent Motor Inn. Right past the small parking lot is the trailhead for both trails. The first 4.5km of the path is similar between Ptarmigan Tunnel and Iceberg Lake. You will climb out of the trees and hug the right side of the valley as you veer right below Mount Henkel. 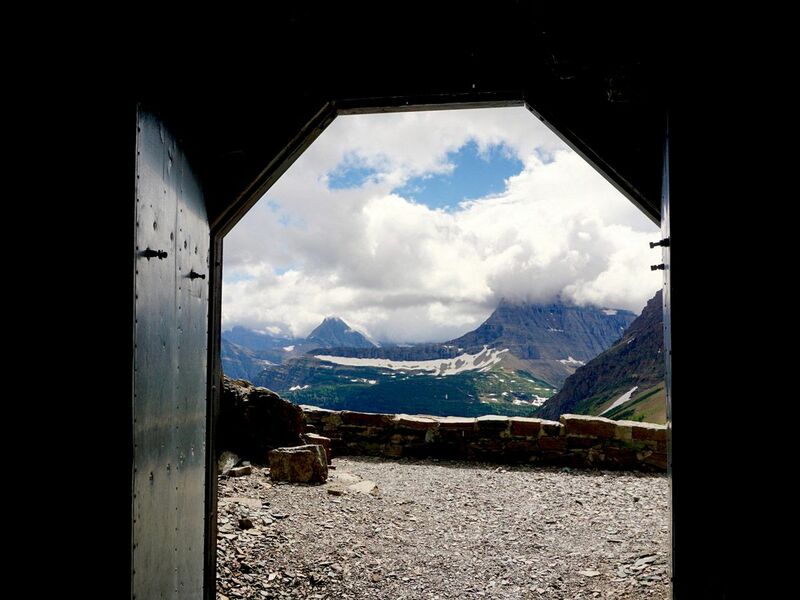 Here, enjoy great views across the valley with glimpses of Mount Grinnell and Mount Wilbur. The grade is slightly uphill, though nothing too steep. You will re-enter the trees as you approach the junction. Right before the junction are the beautiful Ptarmigan Falls, which have a smooth rocky place to sit – a perfect halfway break! After passing over a small bridge and passing the pit toilets, you will arrive at the junction. Turn right to continue to Ptarmigan Lake and Ptarmigan Tunnel. The 1.0km after the junction is quite steep, climbing up through a forest that allows for occasional views of the surrounding peaks. However, after the initial climb you will find yourself surrounded by beautiful alpine wildflowers and spread out trees. Continue along the left side of the valley, below Ptarmigan Wall with views across to Crowfeet Mountain. 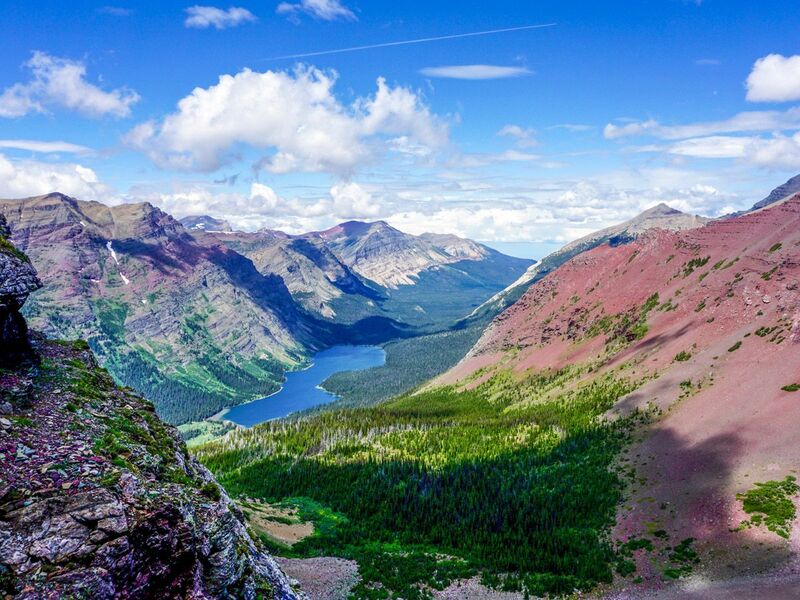 Remain along the trail, entering and exiting spare trees, until you reach Ptarmigan Lake. From here, you can see the long switchbacks working their way up to the tunnel reflected in the stunning lake. As you contour around the left side of the lake you will start the final climb of the hike. The three long switchbacks climb all the way up to just below the pass, where the tunnel suddenly pokes through the rock. It is a tough hike here, and the height gain is deceptive. The Civilian Conservation Corp built this tunnel in the 1930s for horseback tours of the park. Construction included jackhammering from either side (and using several sticks of dynamite) in just less than three months. All the rock that was excavated is used to make the path you can see from the far side of the tunnel. The steel doors were added in 1975 and are closed during the winter. Crossing through the tunnel grants a completely different view. 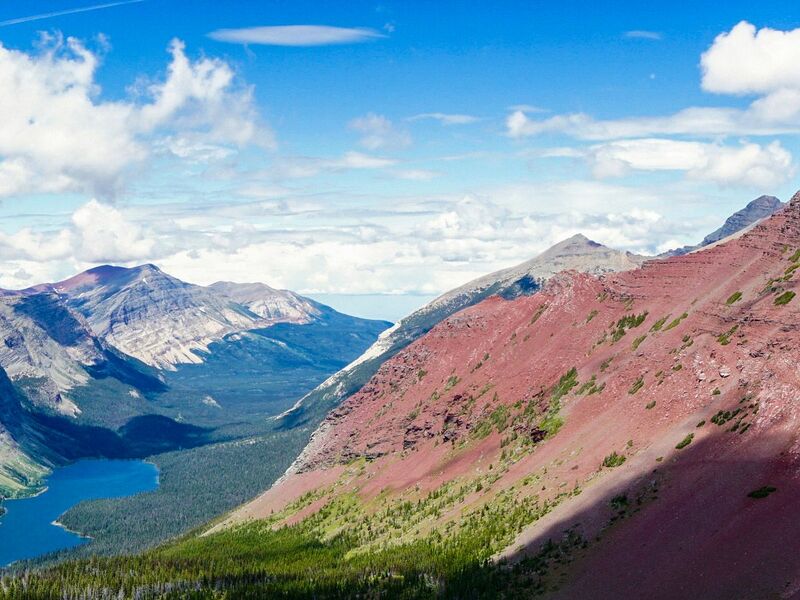 You can see the path clinging to a stunning red mountainside as it contours around and down to Elizabeth Lake. You can also look across the valley at Natoas Peak and the ridge that extends to the right of it. 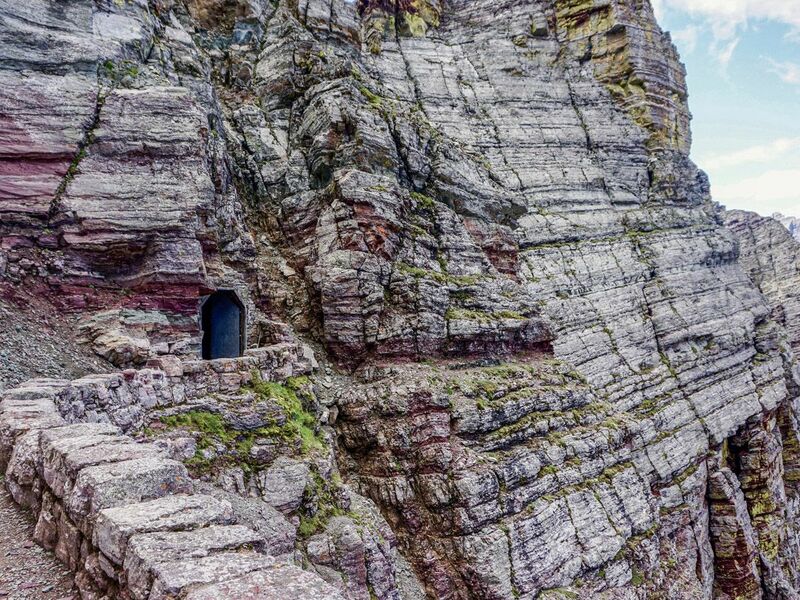 The red stained mountains are a magnificent sight to behold. Look back and up and you see flashes of yellow and green among the grey mountains as well. Return the way you came, today was hopefully a great day for you! 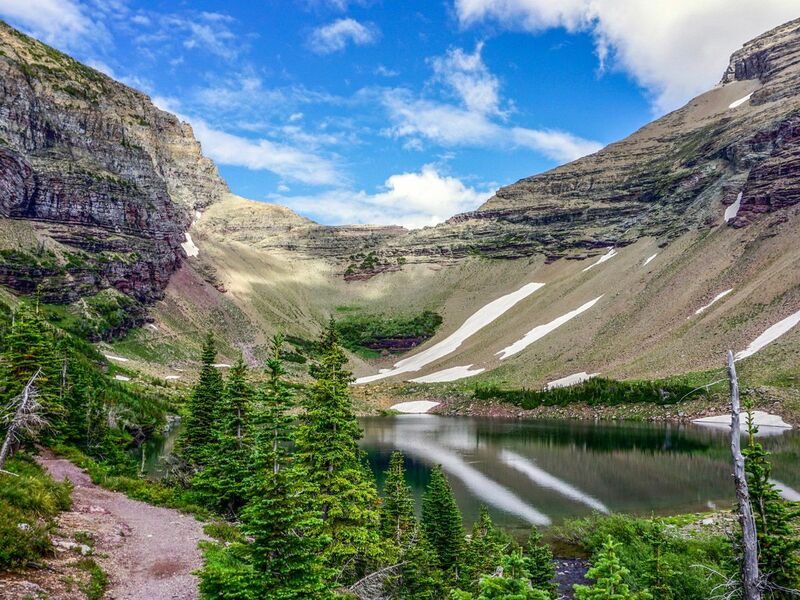 If you have the energy, consider a quick jaunt up to Iceberg Lake when you come to the junction! This hike can be paired with Iceberg Lake, but it’s a long 25.0km+ day. 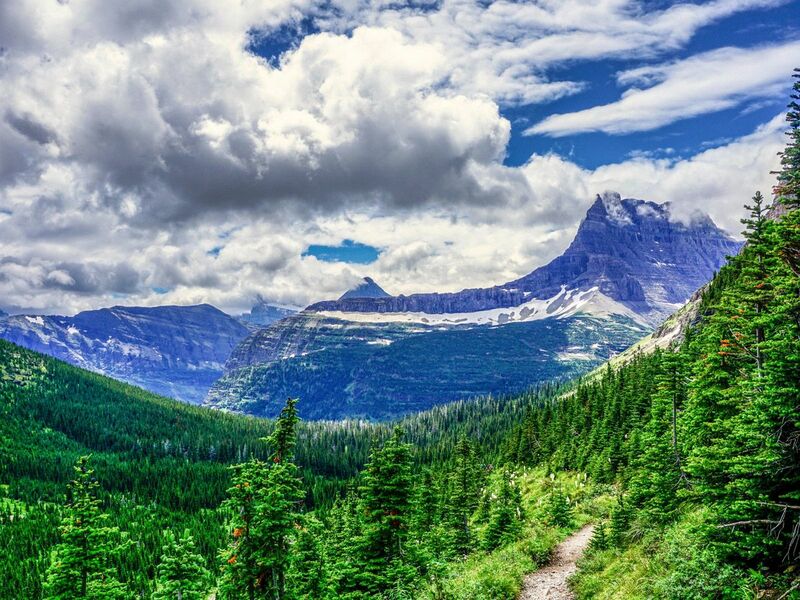 Spend a weekend in Many Glacier and explore all the wonderful valleys.